Basics: 40 channel CB radio, front panel mic connector, SWR warning indicator, SWR calibration, delta tune to clarify incoming signals. Dimensions: W 7 1/4" x D 9 1/4" x T 2 1/4"
Back by popular demand - The 25 LTD and 29 LTD! The 25 LTD and 29 LTD are back...and better than ever! Professional driver-requested improvements include a front panel microphone connector (for convenient in-dash installation), a 9 foot microphone cord (for easy reach anywhere within the cab), and tactile controls (for added convenience and safety when adjusting functions). This modification increases a radio's output significantly. With gain of approximately 100% more output wattage over the performance tune up. It involves an in depth redesign of the radio's transmitter strip, replacing the transmit final with a more powerful transmit final and changing the value of 5 to 7 other components in the strip as well. Details Redesign the transmitter strip - replacing 5 to 7 component values. Replace standard transmit final with higher wattage transmit final. Check the box to the left of the item or items you want to purchase, then click the add to cart button. If you would like more info on the modification or accessory before purchasing just click on the link below. To purchase the radio only just click the add to cart button. The radio is pre-selected for you. Note: We have a minimum radio service fee of $20. While not mandatory to add services, if service items ordered total less than $20 the service amount will be adjusted to $20. 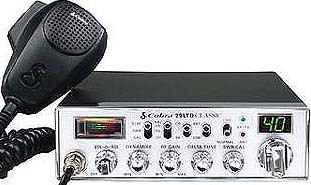 * Special * Buy this radio and get a high end noise canceling mic of your choice at a reduced price.